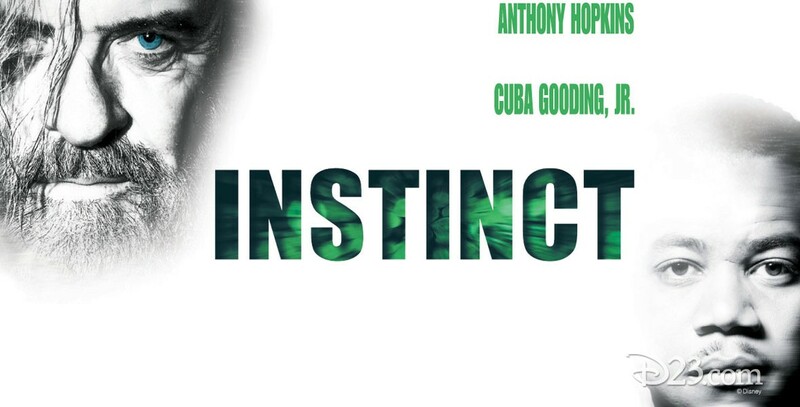 Instinct (film) A brilliant young psychiatrist, Theo Caulder, must unlock the secrets within the mind of Dr. Ethan Powell, an anthropologist who lived in the wilds for three years with a family of mountain gorillas. Dr. Powell, who has not spoken in years, has discovered a secret that could alter the future of mankind, but before his knowledge can be revealed, the psychiatrist must learn the truth behind a homicidal attack in the jungles of Rwanda of which the doctor stands accused, and for which he is now held captive in a brutal prison for the criminally insane. Directed by Jon Turtletaub. A Touchstone picture from Spyglass Entertainment. Inspired by the novel, Ishmael, by Daniel Quinn. Released on June 4, 1999. Stars Anthony Hopkins (Ethan Powell), Cuba Gooding, Jr. (Theo Caulder), Donald Sutherland (Ben Hillard), Maura Tierney (Lyn Powell), George Dzundza (John Murray). 126 min. CinemaScope. Jamaica substituted for Rwanda in the filming; other filming took place in Wisconsin, Orlando, and Los Angeles. Released on video in 1999.